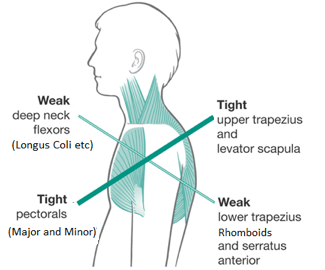 Scapular protraction (slumped shoulders) is a common problem for people with desk jobs. 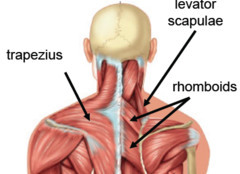 Strengthen your rhomboids by doing shoulder blade squeezes. Sit down on a stool or chair without arms. Let your hands rest naturally on your thighs. 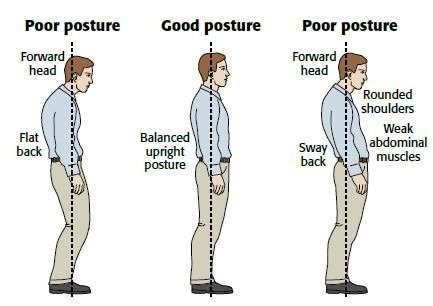 Concentrate on keeping your chin tucked in, shoulders down and keeping your chest up as you squeeze your shoulder blades together. It may help to imagine squeezing a pencil between your shoulder blades. You can even ask a friend to hold a pencil aligned with your spine so you have a target to squeeze your shoulder blades toward. Search for more slumped shoulder exercises. 6 yoga moves to do after sitting at your desk all day | Mindful.Yoga.Health.